San Francisco's Chinatown is the largest and most robust in the nation. The title is challenged only by the Chinatown of Manhattan. Just three blocks from Union square, Chinatown's main streets are Stockton and Jackson. 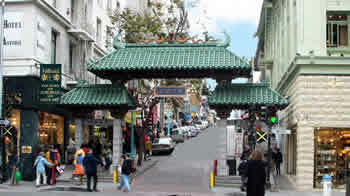 Make a grand entrance by walking through the beautiful Chinatown gateway on Stockton street. Built in 1970, the gateway is the entrance to Chinatown and is inscribed with the saying "All under heaven is for the good of the people." The best way to see Chinatown is on foot. Driving through is difficult and fairly pointless. Park outside the neighborhood, walk in and explore. You'll find interesting shops and fantastic Chinese food. If you haven't ever tried Dim Sum, then this is the place to try it. If you aren't familiar with Dim Sum, you order lots of small appetizer sized dishes instead of one big platter of food. It is similar to ordering tapas in Spain, you order one or two dishes at a time and when you are ready, you order some more. Traditionally, a server will push a cart around the restaurant and you either point at what you want or you can ask for something by name. If you see something interesting, ask what it is. But be forewarned, not all servers are willing or able to explain, and so you may just have to be daring and take a chance.